DOG EAT DOGUnited States Submarine, AL-9, off the coast of Ireland. Cruising submarines remained submerged during the day, reconnoitering with periscopes every 15 minutes. At night they rose to take in air and recharge their batteries. 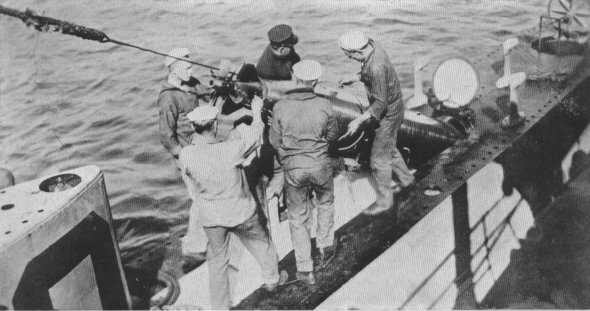 A DOSE OF THEIR OWN MEDICINELoading torpedoes on an American submarine at Bantry Bay. 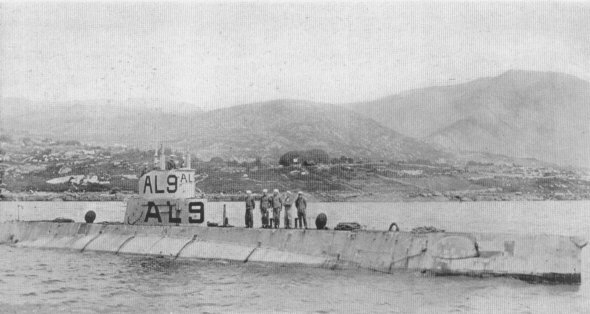 Captured German officers stated that they got used to depth charges but lived in constant dread of submarines. They never knew when an enemy torpedo might hit them.